Out of Dingly Dell Major, through the narrowest of narrows, into Dingly Dell Minor – once over Watling Street and twice under the M54 #narrowboat #England – The Diesel-Electric Elephant Company. Yesterday’s move put me into the mobile interwebnet black hole of Brewood (pronounced “Brood”, apparently). The moorings there are more Dingly Dell than is healthy, and being so low in a cutting lined with massive trees meant that I was enjoying a resurgence of Seasoned Grumpy Git Disorder before I’d even tied off the mooring ropes. I had to move today, there was more wind about than I would ordinarily like, but I had to move! So. The Cardinal and I put just shy of eight miles on the clock today plus what has to be the silliest lock I have encountered so far – the six inch lock at Autherly Junction. That lock was insisted upon in the days when the various canals all made money for different companies, and was put in place to prevent one company “stealing” water from another. Well, to slow down the effect at least, and limit the flow to six inches each time a boat comes through. Fancy having to work a whole lock, stop, moor, gates, paddles, boat in, gates, paddles, boat out again, close gates, close paddles, just for a six inch difference in water levels. My first taste of the day’s narrows, soon to be eclipsed in re “narrowness” by what came later! See header photo for the REAL narrows! ,,,but this was a walk in the park compared to what was to come. I had a slight problem getting the Cardinal out of the lock at Autherley Junction, and around onto the new-to-us Staffordshire & Worcestershire Canal, for our journey east and then north. The water there was such thick, thick leaf-soup that I just couldn’t get any drive at all with the Cardinal’s propellerinatrix, and I had to leap around like an orc, pulling him out of the lock and around the junction on the ropes. It was good exercise for me, I suppose, if a little bit undignified for the Cardinal. It’s not as though you can rush through these narrows either. What little water there is in there has nowhere to go when you try to push a 57′ long by 6′ 10″ wide eighteen ton boat through. More revs don’t help. The leaves certainly don’t help. I have developed a wholly unexpected sympathy (empathy?) with British Rail, and their hitherto risible complaints of delays due to leaves on the line – I now know exactly what they might mean. The narrows north of Autherly Junction on the Staffordshire & Worcestershire Canal Eek, and really, O’Reilly. The cut here had to blasted through rock, and the canal builders weren’t about to waste a single penny blasting wider than was absolutely necessary. I suspect that two-way traffic here wasn’t quite such a problem in the days of cargo-carrying working boats drawn by horses – they would have had crew to go ahead, and a lot more bull and bluster than the Cardinal and I. As British Leyland used to say of two-year old Austin Mini Clubmans when you took four Wolfrace wheels, the ignition keys and two buckets of rust back to the showroom to complain, nothing lasts forever, sir. Indeed the narrows did widen out into the more usual canal widths, and as we cruised under the M54 motorway heading south they widened out quite luxuriously. The M54 motorway crossing over the canal. Nice graffiti (not). Try as I did, I couldn’t time the taking of a photograph to coincide with a stream of HGVs passing overhead. It looks here as though this very busy, very noisy motorway is deserted, it’s not! I can’t remember now, is the M54 six lanes or is it eight lanes? Traffic was thundering overhead as we cruised beneath. Today’s trip, the southernmost portion of this current cruise, took us once under the M54 south and then under again as we turned east and north. Mindful of just how Wolverhampton, lovely though it may be, is just not my sort of place, I kept cruising for a few miles and eventually found moorings on what I hope is the cusp of metropolitan and rural. Far enough out of town to be away, near enough to have a mobile signal. It was a good guess, at least so far as far as the mobile signal is concerned – I’ll let you know tomorrow whether there are any curious incidents of the dog in the night, &etc. Fingers crossed it’s peaceful and bandit-free. It is narrow here to moor up, but it’s not generous anywhere hereabouts, and these are signposted as officially sanctioned, and there is room to pass. Having seen this photo I notice that I have untidied the coal reserve while mooring, come daylight I will have to sort that out. If this place proves to be more Deliverance than Rural Retreat then I’ll just have to stick two fingers up at the wind again and move on once more, whatever. I would like a nice, lazy Sunday though! Mr Stove is persuaded back into action, I have quaffed a dish of spuds and carrots and cabbage and broccoli, sent brief answers to a couple of emails, have a couple more to pen, and then I shall bung my feet up with a good book, or a nice, mindless DVD. Having gone over the Roman Watling Street a couple of days ago I believe that we are soon to go back under it as we head back in the “correct” direction, that being vaguely north… Ancient Briton, Roman, Victorian – am I never to see my own time again? We need a few wind-free days, or at least some days of light breezes. Fingers crossed, eh? That top photo is nightmarish. At first I thought you had resorted to photo altering trickery, but concluded it had to be real. Good to read that you are back in wider waters. 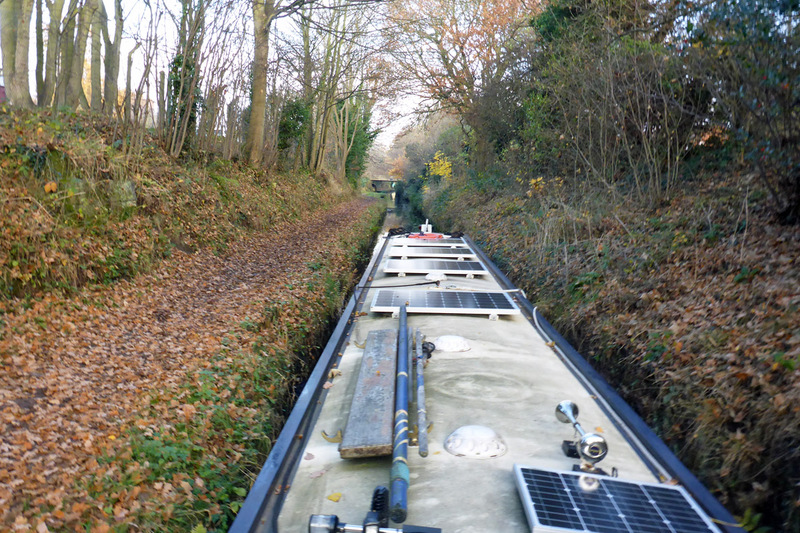 Love the photos and can’t beleive how narrow parts of the canal were.